1920 Anaheim Union High School Band is formed. 1921 E. B. Tozier, Dir. Of Band and Orchestra. Music Dept. 1922 Twenty-six members in the band. All boys. E. B. Tozier, Dir. Band consists of; 7 clarinets, 5 cornets, 2 baritones, 2 tenor, 3 altos, 3 sax., 2 tubas, 2 drums. 1923 Band Recital Concert, March 30, played to a well filled house. Bert F. Steelhead, Dir. “New auditorium lends itself with splendid advantage to a large orchestra and the people of Anaheim enjoyed and appreciated good music. 1924 Twenty-four boys make up the band. Joshua Williams, Dir. 1925 Thirty members. Joshua Williams, Dir. First uniform consist of white pants, white sweater with band insignia and sailor cap with A.U.H.S. in felt letters. Boys devoted one night a week to band practice as they had no regular band class. 1926 Joshua Williams, Dir. of thirty member band. Mr. Williams considers band did well as a newly organized one. 1927 Mr. Williams, Dir. Band reorganized on a military basis. They have class rehearsals including a regular march-day. 1926-27 class is first band to make use of new music building. Band played over radio to boost Anaheim on Anaheim’s radio day. Uniformed sweater changed to gold. 1928 Thirty-six boys under the direction of Joshua Williams. Blue and old striped jerseys replaced sweaters. Marched in Anaheim’s Merchants’ Halloween Carnival & Parade. Took 1st prize for best marching, playing, and costumes. Boys were dressed as gypsy girls with bandanas and skirts. Band marched in Fullerton Armistice Day Parade. 1929 Band is on a military basis with a Captain, Lieutenant, Sergeant, Corporal and Drum Major. Forty-five boys appeared as Persian Beauties at Halloween Parade. “Although most of the Persian were not beautiful by any means at close range, the effect was very comical and caused much laughter along the line of march.” Joshua Williams, Dir. 1930 Mr. Williams still directing an all boy band. Best marching unit in Huntington Beach Armistice Day Parade. First High School Concert given in Anaheim to which admission was charged. 1931 Under Mr. Williams’ direction band won Sweepstake Cup in Armistice Day Parade. Seventy boys in band this year. This is first time band played for Anaheim unit of high school cadets, and was officially a part of that organization. 1932 Fifty-four members. Mr. Williams, Dir. Band divided into Senior and Junior groups. Band is now called Colonist Band. 1933 Joshua Williams, Dir. Band won second place in annual Armistice Parade. They are asked to participate in all civic demonstrations. 1934 Colonists Band consists of 60 members. Band played at Halloween Parade. Armistice Day Parade at Orange and exercises at the improvement of 101 Highway and Music Festival. 1935 Combined Junior and Senior band, consisting of fifty-five members has become an indispensable part of this school. Mr. Williams, Dir. 1936 Anaheim’s band marched into prominence this year. Played at Post Office dedication and Odd fellows Grand Encampment. Band marched in Halloween Parade; with Mad Hatter conglomeration of costumes. Won loving cup in Armistice Day Parade for Best Orange County High School Band. Mr. Williams, Dir. 1937 Fifty-three members. Mr. Williams, Dir. Three girls enlisted as drum majors and were appointed to lead the group in all its appearances. Girls dressed in dark blue slacks, gold blouses and regular caps. The girls add something to the general performance of the band, and it seems that girl drum majorettes are here to stay. Boys uniform consists of white shirts, long ties, white pants and gold capes. 1938 Girls now playing instruments in band, Six girls leading line of march and Colonists flag headed the band. Won special honors for superior marching in the Armistice Day Parade at Fullerton. 1939 For the first time since the completion of the new auditorium the commencement exercises will be held in City Park. As a result, the band, rather than orchestra, will furnish music for this occasion. The ability of the band to play for parades, games and concerts has made it one of the most popular musical organizations in Orange County. Mr., Williams, Dir. 1940 Mr. William Cook, Dir. Eight majorettes wearing short blue skirts and gold blouses are now leading the band During the half-time performance Willard Adams portrays a sailor, Marches down field playing piccolo. Band gathered around him and articles of his clothing were thrown up into the air. Suddenly he emerged in the costume of a Colonist carrying a six foot musket over his shoulder. Band played for Los Alamitos Arbor Day Program and Armistice Day parade. They led the Carnival and Halloween parades. 1941 Under Mr. Cook’s direction the Colonists played for the opening of Santa Fe Station and La Palma Ball Park. Four majorettes now in gold skirts and blue blouses lead band. 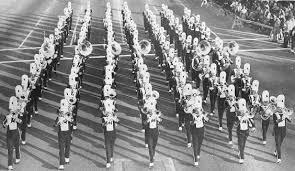 1942 Band played for opening game of the Philadelphia Athletics at La Palma, for home basketball tilts, for Open House and in the annual Music Week Concert. 1943 Uniform changed to blue pants with gold stripes. Gold jacket and military cap was added. Dir. Mr. Cook wore white uniform. 1947 Williams Cook, Dir. Colonists won 2nd place at All-Western Band Review. Band provided half-time music along with 10 other high school bands at game between Oregon & University of Southern California. 1949 Played at eight football games, six parades. Won 1st place at Huntington Beach Parade and 2nd place at Armistice Parade. Special Award at Long Beach All-Western Band Review. 1950 Band has 58 members and participated in every parade which they are still eligible to enter and placed high in every performance in everyone. Jo-Ann Burdick was baton twirler. 1952 Seventy-two members under the direction of Mr. William Cook. 1953 Marched at Long Beach All-Western Band Review in the rain. Played at National City Parade. Six majorettes and four cheer leaders in band. 1954 William Cook, Dir. Band place 14th in Long Beach All-Western Band Review. Band consists of seventy members and seven majorettes and four flag girls. 1955 New Uniforms. Sixty-three members. Placed 3rd at Huntington Beach Parade. Played at nine football games, six half-time performances, public school week, two concerts, one at Fremont and Western Jr. High, Spring Concert and All-County, at Fullerton. Six majorettes preceded band. 1956 Sixty-four members. “owing to their sharp uniforms, crisp marching and synchronized playing, band compiled many points for colonists cause.” Played for half-time at Los Angeles Coliseum for U.C.L.A. games. 1957 Seventy-six members. William Cook, Dir. Junior band has nineteen members and does not perform for school functions. Highlights of year include annual Santa Ana Christmas parade, Halloween parade and participation in Christmas festivities at Disneyland. 1958 Anaheim had two bands this year. Colonists Band presented Bach and Bop tunes. Also appeared at Spring Pop Concert, FBLA Southern Section Conference. They were one of three band invited to Orange County Fair. Gave special performances at Western. Brookhurst and Fremont schools. Second band was called Anaheim’s Blue and Gold Band. They have performed at nine football games and six half-time shows. They are a unit of the Anaheim High School Marching Band and are unique in the fact they are an all brass band. 1959 Robert Reynolds, Dir. Band hosted Rafael Mendez “world’s greatest trumpet player” at Band Concert. Because of excellent rating at Orange County District Contest, band was able to compete at Southern California Regional Contest. Blue and Gold Band & Colonist Band combined to march in Santa Ana parade and returned home with second prize. 1960 Took 1st place at Santa Ana, participated in District Musical Festival, State Music Festival, Arcadia and Santa Ana Parades. 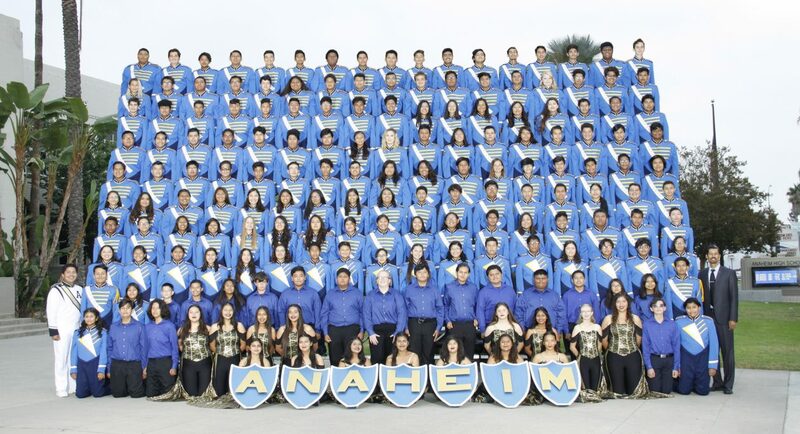 Placed 5th at Long Beach All-Western; this was the 1st time in Anaheim’s history the band has placed at this parade. Robert Reynolds, Dir. 1961 Took part in dedication of Martin Luther Hospital. Concert Band was selected number one of ten best bands in Southern California, enabling them to compete in the sixth Annual Corona Band Jamboree where they placed sixth. Making it only the second time in Anaheim, in fifteen years, the band brought home a superior rating from the District Concert Band Festival in Newport Beach thus permitting them to go on to the regional contest in Long Beach. Los Angeles Times picked then as the best marching band of 30 high schools in Orange County. Traveled to Arcadia, Corona, Hawthorne, Orange, Long Beach and Disneyland. Robert Reynolds, Dir. 1962 Under direction of Robert Reynolds, Anaheim Colonists placed second at Hawthorne Parade, fourth at Arcadia and first at Santa Ana. Again placed in finals at Corona Band Jamboree. They played at District Band Festival and Regional Band and Orchestra Festival; Drum Major Pete Arenskov made headlines as Anaheim’s First Drum Major. 1963 Ted Clark, Dir. Captured third place at Corona Band Jamboree. Los Angeles Times chose band as “Best Band in Orange County” for fourth consecutive year. Concert Band rated superior at District & Regional Band and Orchestra Festivals. Captured third place among top ten marching bands. Bob Hatherly, Drum Major. Anaheim Union HS District held First Annual Band and Drill Team Spectacular at La Palma Park Stadium. 1964 Don Wilcox, Dir. 74 members. New uniforms. District Band Festival hosted by Anaheim. Once more Anaheim’s Band chosen best in Orange County. Participated in Chaffey Parade and half-time show review, Long Beach All-Western Band Review, Hunting Beach Band Review, Corona Band Jamboree and Monterey Park Band Review. Colonists outscored every other band in all events. Jim Blansett, Drum Major. 1965 Don Wilcox, Dir. 108 members. Judges Trophy awarded for top performance at Chaffey. Sweepstake at Hawthorne. Colony marchers Map “A” for Anaheim and win contests under John Hausey, Drum Major. Took fifth place at Arcadia and third place at Long Beach. Sweepstakes at Corona. Band marched at Rams half-time show. 1966 Anaheim Colonists Marching Band numbered 110. Band and Drill team received top honors and five trophies at Chaffey Performed at Rams half-time show. First time a high school band has been asked to appear twice at Rams professional football game. Show was televised. Don Wilcox, Dir. Rick Krey, Drum Major. 1967 Ross Davis, Dir. introduces new ideas and techniques. “Doc Severinsen” performed with concert band at Spring Concert. Marching band won first place at Rosemead. First place & Music Award at Chaffey. Sweepstakes at Hawthorne for third straight year. First time in school history Anaheim took Sweepstakes at Arcadia. First place at All-Western Band Review. Shared Sportsmanship Trophy with Loara. Received third highest score out of 72 bands at All-Western. Traveled to National City near San Diego for last parade of year. Drum Major, Paul Davis only Drum Major in state to win three major competitions. 1968 Band performed at Los Angeles County Fair. At Tustin Tiller Day Parade, Anaheim split band into two separate entries. The two units took Sweepstakes and first place – the two top awards. Anaheim Halloween parade becomes competitive event for first time Anaheim won trophy. Won first place at Hawthorne. Sweepstakes and Silver Baton Award at Arcadia. Took first place in Class A at All-Western Band Review. Missed Sweepstakes at All-Western by 1/10 of a point. Brad Stankey, Drum Major. 1969 Ross Davis, Dir. 121 members. Band marched in two groups, at Buena Park’s Silverado Day Parade. Each group won first or second place. The band as one group received the Music Award James Christensen, Music Supervisor and Director of Band at Disneyland conducted own composition “Overture Americana”. Band won Sweepstakes at Hawthorne and Chaffey and second at Long Beach All-Western Concert. Concert Band received standing ovation for performance of Camelot at Pop Concert. Seven high schools and 13 junior highs joined at Anaheim High School for two-day District Band Festival. Brad Stankey, Drum Major. 1970 Ross Davis, Dir. New Uniforms. Performed at Los Angeles County Fair, Band Spectacular at Big “A”(Anaheim Angel’s Stadium). Took second place trophy at Rosemead, Sweepstakes at Hawthorne, Marched in Halloween parade and Christmas parade at Disneyland, and La Mesa competition. Won first place at All-Western. Ross Davis completes fourth year at Anaheim. Terry Morris, Drum Major. Red, white and blue Anaheim banners were added. 1997-2002 David Ameele, Dir. joins the faculty at AHS as a graduate of the prestigious Eastman School of Music. Mr. Ameele energizes the Colonist Jazz Band and invites Jazz Artists such as Bruce Babad and Bobby Rodriguez to regularly perform for students. Band students such as Bincins Garcia, Breysi Garcia, and Fernando Martinez would later become high school band directors in Southern California. 2003-2009 Scott Domingues, Dir. The Music Program continues expanding and is established as a full bodied program including a quality Concert Band, Symphonic Band, and Wind Ensemble in addition to the existing Marching Band, Drumline, and Jazz Band. Concert Bands receive Superior ratings at SCSBOA Festival. Membership grows from 75 to being consistently over 110 strong. 2010 Breysi Garcia, Dir. Colonist Band Alumnus and former Drum Major from the class of 2000 joins the AHS faculty. A new level of entertainment value gets introduced to the program. Field show is music of Cirque Du Soleil’s “La Nouba”. Parade March is “Father of Victory”. Colonist Drill Team is reintroduced to the Pageantry. 140 members in full unit. Drum Majors are Ruby Rodriguez and Claudia Esparagoza. Drumline wins high awards and competes in ADLA Finals. 2011 Field show is titled “Groovin’ On the Latin Side” featuring the jazz hits of Chuck Mangione. Drum Majors are Ruby Rodriguez and Claudia Esparagoza. Parade March is “His Honor”. Colonist Jazz Band becomes a competitive ensemble during the spring semester. 2012 Field show is titled “A Salute to our American Heroes” featuring cinematic music of John Williams. Drum Major is Evany Marin. Parade March is “Americans We”. Colonist Jazz Band gets First Place at the Esperanza HS Jazz Festival. Mr. Garcia directs the All-District Massed Band at the 50th Annual Anaheim Union HS District Band & Pageantry Spectacular at La Palma Park. 2013 Field show features the music of “West Side Story” and receives high scores at various competitions. Drum Major is Fabiola Gutierrez. Parade March is “The High School Cadets”. Colonist Jazz Band places Third at Fullerton College Jazz Festival. Drumline wins American Drumline Association Championships in the Scholastic B Division, scoring higher than over 45 other drumlines. 2014 Field show is titled “A Nightmare in Wonderland” and features the music of movie composer Danny Elfman like the Nightmare before Christmas along with the themes of the classic story of Alice in Wonderland. Drum Major is Jennifer Legasse. Parade March is “Ancient and Honorable”. Wind Ensemble receives Unanimous Superior Ratings at SCSBOA Festival. Marching Band performs at Chinese New Year’s Parade in San Francisco which is a televised event viewed by millions of people. 2015 The field show is a concept show titled “rEVOLVE” and includes original music that creates a visual theme of revolving and evolving. Drum Major is Martin Gonzalez. Parade March is the popular Mexican tune “Zacatecas” and receives First Place at the Loara HS Band Review. Wind Ensemble receives Superior Ratings at SCSBOA Festival. 2016 Breysi Garcia, Dir. 150 members strong. Field show is “The Last Great Bullfighter” including music “El Cascabel”, “The Libertango” and “El Relicario”. Drum Major is Joaquin Fernandez. Band receives First Place at Loara Field Tournament. Parade March is “St. Julien” and the Colorguard receives First Place at the Loara HS Band Review. Marching Band gets new uniforms with both classic and contemporary qualities. 2017 Field Show title is “Walk the Plank” and features pirate and sailor themes. Drum Major is Julie Enciso who goes on to major in music education. Parade March is “The Klaxon” and band receives 2nd place in Band Review. Field Band takes first place at Rowland Field Tournament. For first time in recent history, both Symphonic Band and Wind Ensemble receive Unanimous Superiors at SCSBOA Festival. Jazz Band receives 2nd place at Fullerton College Festival. Ricardo Aguilar, Julie Enciso and Jesse Toro represent AHS at the Tournament of Roses Honor Band. 2018 Field Show is “Arabian Nights” and features music from Scheherazade. Drum Major is Jesse Toro and band receives 2nd place at every competition scoring higher than almost all of Anaheim District Bands. Percussion took Sweepstakes trophy at Kennedy Field Tournament and broke a score of 80 on the field and a score of 90 at the Loara Band Review where they took 2nd place. Jesse Toro, Madison Brickner, Angel Avalos, and Miguel Jimenez represent AHS at Tournament of Roses Honor Band.